Summer is here!! We have Free Wi-Fi !! Free Beach Service!! Newly renovated, Luxurious gulf front 2 bedroom, 2 bath oversized condo features a spectacular view of the gulf and coastline. Located on the Gulf, it is less than 300 feet to the beach, with NO streets to cross. 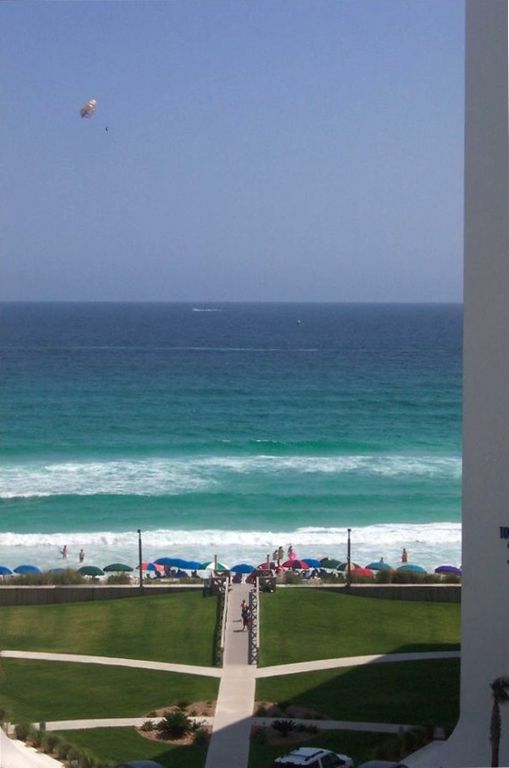 Shoreline Towers is a private security gated complex with one of the largest private beaches in Destin. We feature tennis courts, swimming pool, clubhouse with exercise room, beach life guard with beach chair and umbrella provided for our guests. Shopping and great restaurants are within easy walking distance. This is a large 1550 square foot unit overlooking the Gulf of Mexico. Watch the dolphins playing in the emerald green waters from the bedrooms, living room, dining room or while you are preparing your eggs benedict and mimosas in the fully equipped kitchen. We now accept PayPal. Contact owner for further information. Furnished for your vacation pleasure, your stay on the sugar white beaches at Shoreline Towers will make you want to come back year after year. Cable TV in both bedrooms and living room. Perfect place to stay for any beach lover. Only a few steps away from the beach and the properties amenities were great! The condo was clean and was perfect for our family. the view was gorgeous; we were right on the beach. we were directly down the road from all destins attractions. the pool was very clean and I love how family oriented the owners were. not many people would trust 3 boys under the age of 10 to stay in their home away from home. will definitely return! Thank you for the kind words. We appreciate it. We strive to make our home comfortable for families going on their much needed vacation to the beach. Updated, in very good condition. This condo is fabulous!!! The softest beds and towels you'll ever find! Plenty of room for everyone in this massive condo! We were a little sad about the condo being set back in a little from the ocean but still had amazing views and the few feet away from the beach was still amazing. This condo is the third tower which sets back in between 2 oceanfront condos. But again we were not disappointed!!! This condo was beautiful, and perfect for our family of 4! The furniture was very nice and super comfortable. While it is located in the back tower, you still get great views out of every window. The beach chair service was a nice bonus too! We loved the location as it was within just a few minutes of several restaurants, shopping, and activities for the kids. We had a great trip, and hope this is available on our next visit! The condo was beautiful and very well decorated!